The picture you see on the left is a replica of the mosaic terracotta flooring we have at the front entrance of our house. 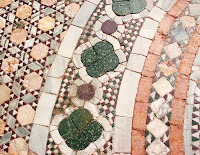 The flooring in the foyer is also made of mosaic tile. These tiles, made of intricate patterns and designs, are popularly used in home entryways and backsplashes because of its unique and/or colorful effect which makes the floor more attractive compared to plainer flooring tiles. They are also popularly used in countertops, bathrooms, and swimming pools. Mosaic tiles are also popular with commercial establishments (malls, hotels). Next time you visit the mall, look at the floor. Is it made of patterns and designs of different colors and shapes? 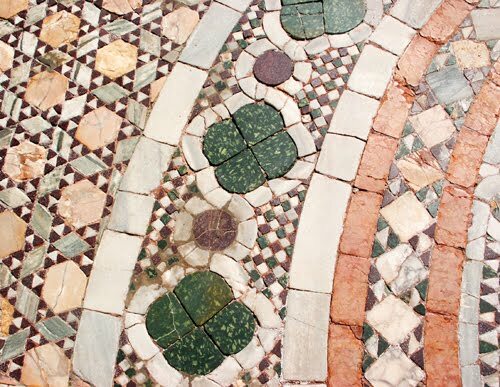 Chances are, you are walking on a mosaic floor tile.